Breaking: Judge Barbier tosses most of the Vandenweghe suit, Whistleblower claims survive. Folks I was headed out the door when I found out. I have read Judge Barbier’s order (on the quick) and sent out an inquiry. The whistleblower claim survives. I’ll have the order and reasons when I get back. Update – the 27 page Order and Reasons. 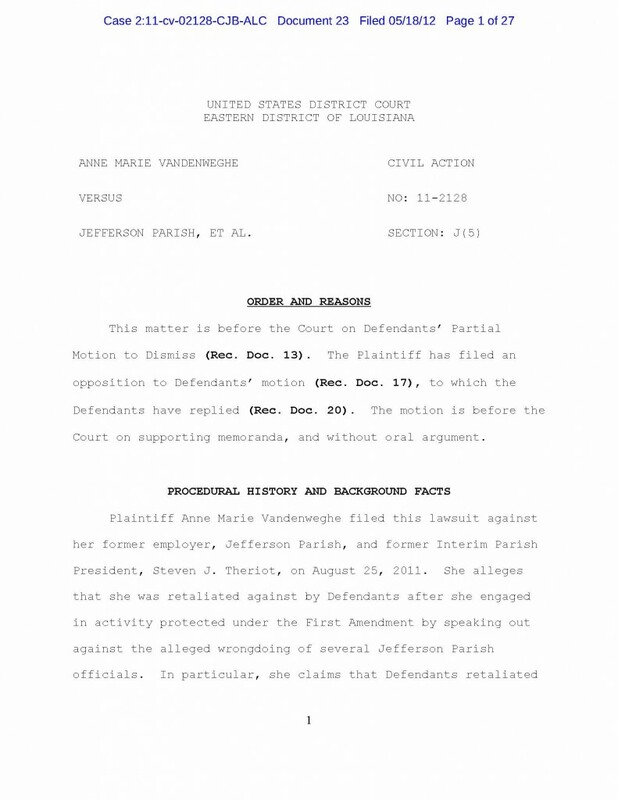 Author Douglas HandshoePosted on May 18, 2012 March 14, 2014 Categories SopTags Vandenweghe v Parish of Jefferson3 Comments on Breaking: Judge Barbier tosses most of the Vandenweghe suit, Whistleblower claims survive. Jim Brown’s Weekly Column: We’re too big to fail so let the taxpayers cover our losing bets! WE’RE TOO BIG TO FAIL SO LET THE TAXPAYERS COVER OUR LOSING BETS! I drive each day by my local bank. It’s a Chase branch of J.P. Morgan. I don’t have much to save, but I count on my bank to invest my money. Not bet my hard earned dollars, but invest it. If I want to gamble for winnings, I’ll take my chances on the red and the black at a casino. I don’t need or want my bank to lay down a bet on some complicated credit default swap or other exotic roll of the financial dice. But that’s exactly what Chase has been doing with my money. They have taken a big hit. And I’m not happy. J. P. Morgan Chase & Co. put a lady named Ina Drew in charge as chief investment officer. They paid her $14 million a year to grow my small investment. And she had a team of highly paid executives to follow her lead and see that my small savings continue to grow. But she bungled her responsibility to me and millions of other Chase savers, and now she’s been fired. Good riddance. She apparently bears the bulk of the responsibility for a $2 billion investment loss that involved complex derivatives that were not adequately insured. There was a “make the big bucks” mentality rather than a focus on the quality of the loans that were being made. Author Douglas HandshoePosted on May 18, 2012 March 14, 2014 Categories Jim BrownTags Jim Brown10 Comments on Jim Brown’s Weekly Column: We’re too big to fail so let the taxpayers cover our losing bets! And what in the blue hell does this have to do with Slabbed? In the case of Mr Neilson some of my former partner in blog Nowdoucit’s finest blogging was done on that abortion of a prosecution that was USA v Neilson that included Slabbed classics such as FBI Agent Hal Neilson may face new trial by “selective punctuation” in “The Case of the Misplaced Modifiers” and “The Case of the Misplaced Modifiers” – FBI Agent Hal Neilson a victim of “selective punctuation” and his “trial by grammar”could result in “run-on sentence”!. We’re not just a hanging blog folks as we call these cases like we see ’em. Lest I digress. Yesterday Slabbed began getting site referrals from Investor Hub, the first US-based internet content provider to obtain relief under the US SPEECH Act. Irony aside it appears Mr Neilson has moved on getting a job as CEO at the publicly traded sub penny stock company Here Enterprises per this 8K filed yesterday with the Securities and Exchange Commission. Shares of Here traded up 60% on the news but it still failed to break a penny in heavy trading yesterday on the pinks. To the extent Mr Neilson is an outlier in that he actually beat federal criminal charges perhaps lightening will strike at his new employer, which is in the wind energy business. Moving right along something that most people would consider bizarre happened on one of my old posts about Canadian Insurer Kingsway Financial Services, specifically that Hedge Fund manager Joe Stilwell belongs to a cult led by actress Sharon Gans, whose current occupation Wikipedia indeed lists as Cult Leader. Normally I’d be intrigued but not much interested in such a sideshow to one of my posts but it appears Stilwell went to court recently to have information about himself removed from a blog about the Gans cult. Frankly I have some heartburn about some of the information presented because it is not independently sourced, but then again these people claim to be survivor/escapees from the Gans cult who are far from your average proverbial anonymous bloggers so you have to take what they are saying with a bit more than a grain of salt. For those so interested in reading what Stilwell went to court to have removed, click here. Stilwell specializes in extracting new age greenmail from smallish undervalued community banks besides investing heavily in insurers that run scams.